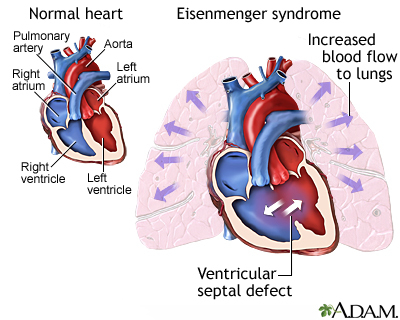 Eisenmenger syndrome is a condition that affects blood flow from the heart to the lungs in some people who were born with structural problems of the heart. Eisenmenger syndrome is a condition that results from abnormal blood circulation caused by a defect in the heart. Most often, people with this condition are born with a hole between the two pumping chambers -- the left and right ventricles -- of the heart (ventricular septal defect). The hole allows blood that has already picked up oxygen from the lungs to flow back into the lungs, instead of going out to the rest of the body. Over many years, increased blood flow can damage the small blood vessels in the lungs. This causes high blood pressure in the lungs. As a result, the blood flow goes backward through the hole between the two pumping chambers. This allows oxygen-poor blood to travel to the rest of the body. Eisenmenger syndrome may begin to develop before a child reaches puberty. However, it also can develop in young adulthood, and may progress throughout young adulthood. The number of cases of this condition in the United States has dropped because doctors are now able to diagnose and correct the defect sooner. Therefore, the problem can be corrected before irreversible damage occurs to the small lung arteries. At times, people with symptoms may have blood removed from the body (phlebotomy) to reduce the number of red blood cells. The person then receives fluids to replace the lost blood (volume replacement). Affected people may receive oxygen, although it is unclear if it helps to prevent the disease from getting worse. In addition, medications that work to relax and open the blood vessels may be given. People with very severe symptoms may eventually need a heart-lung transplant. How well the affected person does depends on whether another medical condition is present, and the age at which high blood pressure develops in the lungs. People with this condition can live 20 to 50 years. Polycythemia can occur when there are too many red blood cells in an infant's blood. Call your provider if your child develops symptoms of Eisenmenger syndrome. Surgery as early as possible to correct the heart defect can prevent Eisenmenger syndrome. Marelli AJ. Congenital heart disease in adults. In: Goldman L, Schafer AI, eds. Goldman-Cecil Medicine. 25th ed. Philadelphia, PA: Elsevier Saunders; 2016:chap 69. Webb GD, Smallhorn JF, Therrien J, Redington AN. Congenital heart disease in the adult and pediatric patient. In: Zipes DP, Libby P, Bonow RO, Mann DL, Tomaselli GF, Braunwald E, eds. Braunwald's Heart Disease: A Textbook of Cardiovascular Medicine. 11th ed. Philadelphia, PA: Elsevier; 2019:chap 75. Children born with Eisenmenger syndrome are born with a hole between the two pumping chambers -- the left and right ventricles -- of the heart (ventricular septal defect). The hole allows blood that has already picked up oxygen from the lungs to flow back into the lungs, instead of going out to the rest of the body. The increased blood flow and high pressure damages the small blood vessels in the lungs.